From Taurus USA comes the world’s only curved firearm that’s engineered to fit your body. No larger than the size of a smartphone, the Taurus Curve is the ultimate concealed carry firearm. The minuscule .380 has a clip so that you can hook into your waist ban. No one will know you’re carrying, and neither will you as thee comfortable gun does not chafe or leave bruising like other weapons when they are against your hip. 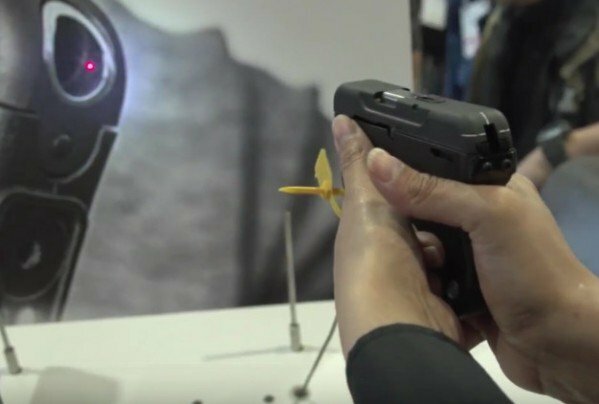 The Curve also comes with a light and laser scope built right into the frame for ease of aiming in the most stressful situations. Exceptionally accurate and extremely lightweight at 10.2 ounces, the Curve is great for women and anyone else who wants an easily to conceal weapon for self-defense. We spoke with Maria Espinosa at SHOT Show 2016 about the guns.